The proclamation by Dr. Bennet Omalu, played by Will Smith in the Hollywood blockbuster Concussion, is one that resonates with Michael Cinelli, associate professor in Laurier’s Department of Kinesiology and Physical Education. 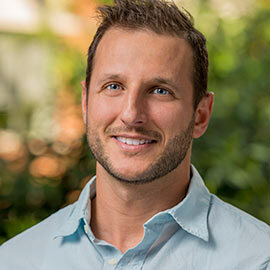 A leading concussion researcher at Laurier, Cinelli aims to understand the relationship between visual perception and physical output in concussed adults. Working closely with Laurier’s athletic teams and athletic therapists, Cinelli tests and assesses the concussed athlete’s perception-output relationship, determining if they have properly recovered. Long-term damage is exactly what Omalu found during the autopsy of Mike Webster, the famed Pittsburgh Steelers football centre. Webster died at the age of 50, suffering from dementia, bouts of rage, confusion, and substance abuse during his post-football years. Omalu found extreme damage to Webster’s brain, something now known as Chronic Traumatic Encephalopathy (CTE). Ontarians are sadly familiar with the story of Rowan Stringer, a 17 year-old rugby player from Ottawa who died as a result of Second Impact Syndrome (SIS), the onset of a second concussion before the initial trauma heals. Stringer, eager to return to play, suffered two concussions in one week in May 2013. Cinelli wonders if better concussion education could have prevented Stringer from returning to play, avoiding the second, fatal injury. Rowan’s Law, a set of recommendations resulting from the inquest in to the teen’s death, has been put forward to policy-makers. If passed, the law would require protocols such as medical clearance of concussed athletes before they can return to play, mandatory concussion educations for players, parents, and coaches, and the immediate removal of a young athlete from the game if a concussion is suspected. Several American states have concussion-related legislation, but Canada has no such procedures in place. Continuing to raise awareness about concussions, and the severity of their risks, is a crucial step in the management and treatment of such brain injuries. Cinelli and a team of student volunteers have taken their message public through Team Up Laurier, a local branch of an American-based education initiative offering concussion education to local elementary and secondary schools. Cinelli is also coordinating a concussion symposium, scheduled for February 2016 at Laurier’s Waterloo campus. While athletes in contact sports are at a greater risk of experiencing a concussion, it is a serious medical condition that can affect anyone. A fall down the stairs, a motor vehicle accident, or an intense jarring of the head can all cause concussions. Symptoms range from dizziness, and confusion, to headaches and forgetfulness, but evidence of a concussion can also be delayed, complicating the treatment and recovery process. For those who think they may be concussed, or suspect a concussion in someone else, Cinelli suggests seeking the care of a medical professional as soon as possible. He also stresses the importance of communicating new or changing symptoms to a medical professional. The absence of symptoms, he cautions, does not always indicate recovery. Questions about concussions and related research can be directed to Laurier's Lifespan PsychoMotor Behaviour Lab at LPMBLab@wlu.ca.